Understanding different types of glue. If there's one material, besides wood, that's central to furniture making, it's wood glue. Since ancient times, glue has been used to assemble furniture and it's not difficult to see glued pieces that are hundreds of years old. Just take a trip to an art museum and look at furniture from ancient Egypt or the European Renaissance. While the purpose of glue hasn't changed over the years, the technology certainly has. Now there are any number of specialty glues designed for all sorts of different applications. Fortunately, only a few play an important role in furniture making. The earliest glues were hide glues and these are still in use today. Hide glue is made from animal products and it's extremely useful for projects, like musical instruments, that often require disassembly to make repairs. Because heat and humidity cause hide glue to release its bond, it's a relatively simple matter to separate pieces without damaging them. Hide glue also cures slowly, so it can be a good option for difficult joints or constructions that take a long time to assemble. However, the goal of most furniture work is to create something that can withstand exposure to just these elements, heat and humidity. Fortunately, today's furniture maker has other options. Two-part epoxies are probably the most durable of all adhesives. For situations where extreme water resistance is required, epoxy is the best choice. Unfortunately, it's pretty difficult and messy to use. And epoxies are quite toxic, so you need to don gloves and a respirator to protect yourself from chemical exposure. These inconveniences make epoxies a bad choice for everyday work. One of the latest adhesives to appear on the furniture making scene is polyurethane glue, which is supposed to be well-suited to just about any gluing job. This glue performs unlike any other. It actually cures by being exposed to moisture, so it's a good choice when moisture resistance is an issue. You even have to dampen wood surfaces before applying this glue. This product changes into a foamlike substance as it cures and in the process expands out of the joint. This can make sanding away the glue more difficult. Also, because it's so new, it can't claim the long-term successful track record that other glues enjoy. The most common furniture making glues are polyvinyl acetate adhesives, known casually as white and yellow glues. While white glue is a good general adhesive that can be used on most porous materials, yellow glue has been specifically formulated for interior woodworking applications. Yellow glue is usually referred to as aliphatic resin glue. Neither of these glues work well if a water-resistant bond is required. They are poor choices for building things like high-end exterior doors or outdoor furniture. For these purposes there are water-resistant formulations of yellow glue. These are technically known as cross-linking PVAs, and they cure through chemical reaction, instead of evaporation. 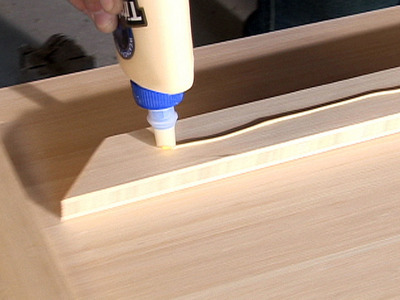 For general woodworking use, this glue is interchangeable with normal yellow glue except that it can't be cleaned up with water after it cures. While each of these products has its place in the furniture maker's repertoire, aliphatic resin glue is the best choice for the beginner. It's easy to use, requires no mixing, is nontoxic and cleans up with water. It also sands cleanly, without overclogging the sandpaper, and leaves an invisible glue line if the joint is tight. Like all glues, however, it does have a finite shelf life. Once it's open, it's only good for about a year. If you notice that the glue starts to smell sour and becomes extremely thick or stringy, it's past its prime and shouldn't be used. The basic furniture maker's glue assortment includes (from left) waterproof yellow glue, white glue, yellow glue, epoxy (in front), polyurethane glue and hide glue. In preparing a glue joint, it's important to keep a couple of ground rules in mind. First, while modern glues are amazingly strong, if joints do not fit properly or the glue is not allowed to cure correctly, the bond will almost surely fail. And second, less is more. A thin, even layer of glue will form a strong bond between two pieces of wood, but a thick cushion of glue does just the opposite. It weakens the joint. And, usually you won't know if this joint is weak until the piece is done and has been used for a while. To achieve a successful edge joint, the long mating surfaces must be perfectly tight all along their length. You shouldn't rely on clamps to pull bowed boards together because this places too much stress on the joint and eventually it will fail. The fit of a mortise-and-tenon joint should also be precise, neither too tight nor too loose. If the parts must be forced together, there will be no room for the glue between the pieces and the joint will be starved. If, on the other hand, there is too much play in the joint, the glue layer will be too thick to perform properly when the piece is placed under stress. 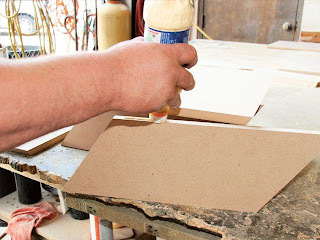 In a perfect joint, the glue layer is less than the thickness of a sheet of notebook paper. In order to guarantee that there is sufficient glue in a joint, spread a thin layer on both mating surfaces. In a mortiseand-tenon joint, this means coating both the mortise and tenon walls with glue. You can use a scrap stick, a small brush or a narrow roller to do this. Just make sure the coverage is complete and even. The mating surfaces must also be clean, dry and free of contamination before you spread the glue. Oil, waxes and some chemicals, like silicone, will resist the glue. And dust and water can cause the joint to fail by preventing good contact between wood surfaces, or diluting the strength of the glue. All glues have a recommended open time, which defines the amount of time you can safely leave the glue exposed to the air before assembling the joint. For most yellow glues, this is about 10 minutes. But the open time will vary with the temperature and humidity of your workroom. Hot, dry conditions will cause the glue to set quicker. In complicated assemblies, where many joints must be prepared at once, it's important to factor the open time limit into the process. Sometimes, you'll have to assemble a project by making smaller subassemblies first. Also, keep in mind that yellow glue will not perform well in cold conditions. 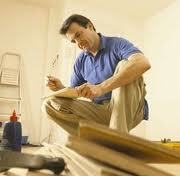 Most manufacturers recommend that both the room and the wood surfaces be at least 55 degrees F before applying glue. Once a joint is assembled, it must be clamped together. Clamps serve two purposes. They pull a joint together tightly and hold it in a fixed position while the glue sets. You should not apply tremendous force with your clamps because this will drive too much glue from the joint. Just firmly tighten them and set the assembly aside. If a proper amount of glue has been spread and a proper amount of force used to tighten the clamps, you should see small beads of glue squeezing out of both sides of the joint. To remove this squeeze-out, allow it to set for about 20 minutes, and then use an old chisel or putty knife to scrape off the excess. Some people recommend wiping the excess glue off with a damp rag. But this technique should be avoided because it can force glue into the surrounding wood pores–especially with open-grain woods. Unfortunately, this glue will not be apparent until you apply the finish, when it's too late to do anything easily to fix it. Finally, yellow glue should be allowed to set for at least an hour before you remove the clamps. And a full cure takes at least 24 hours, so don't disturb the assembly until this time has passed.